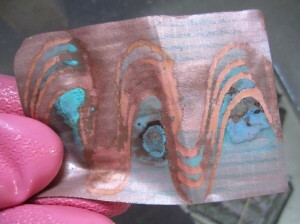 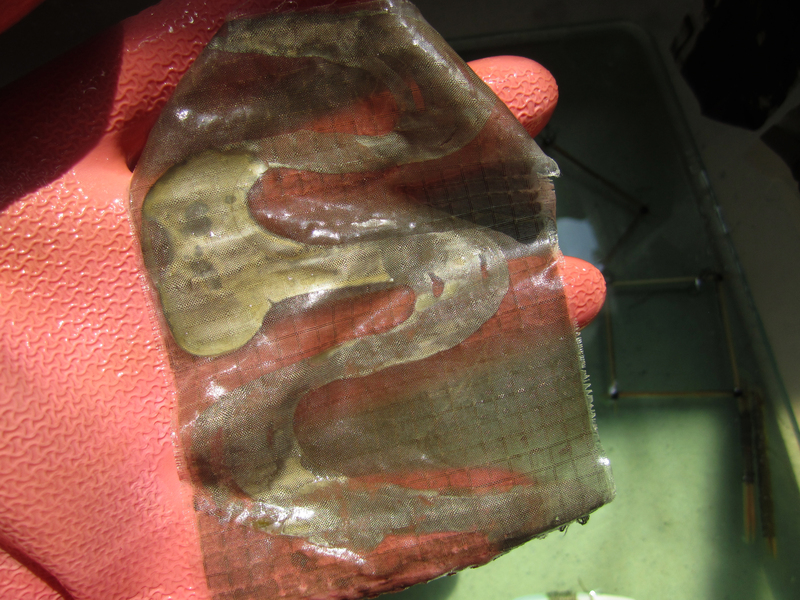 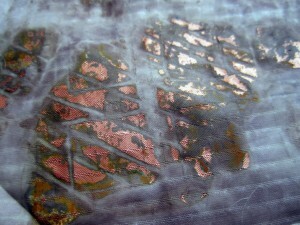 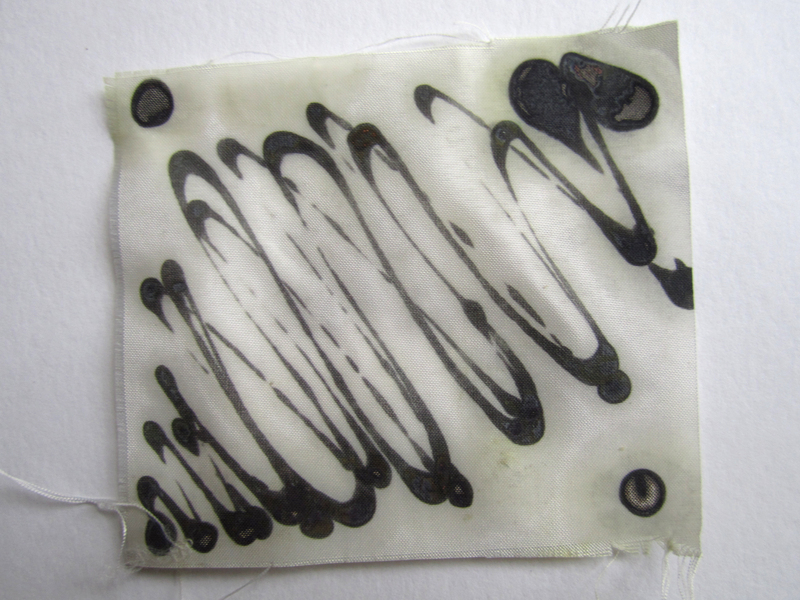 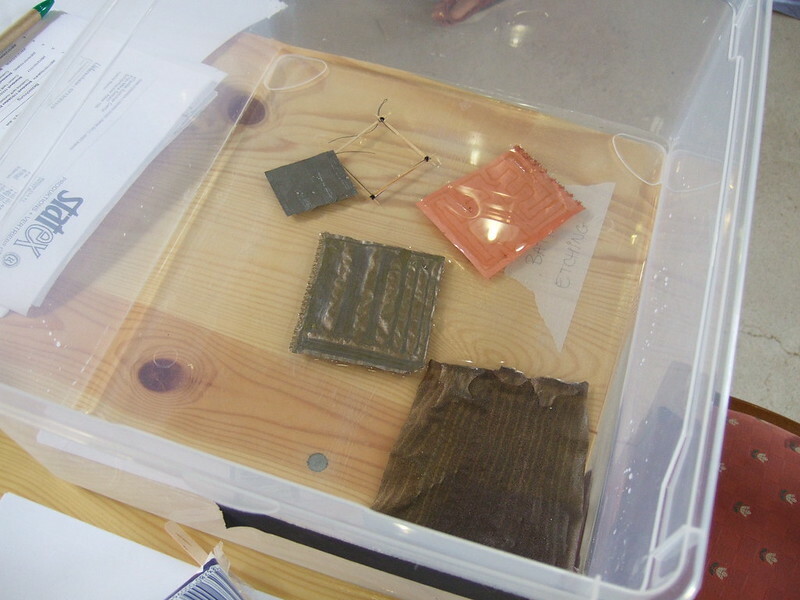 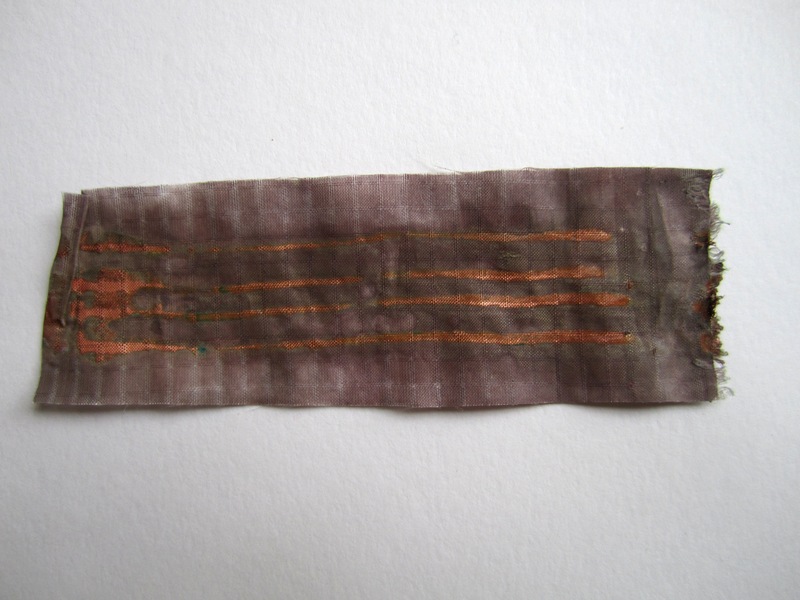 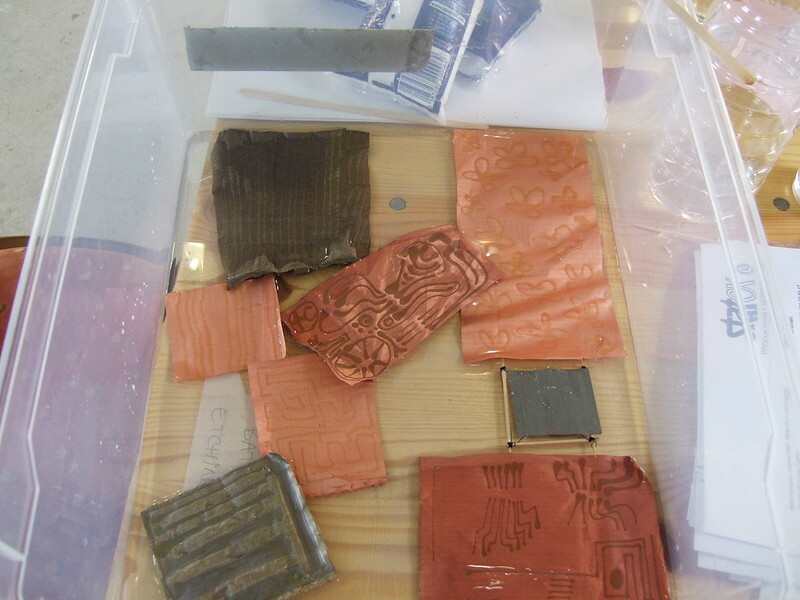 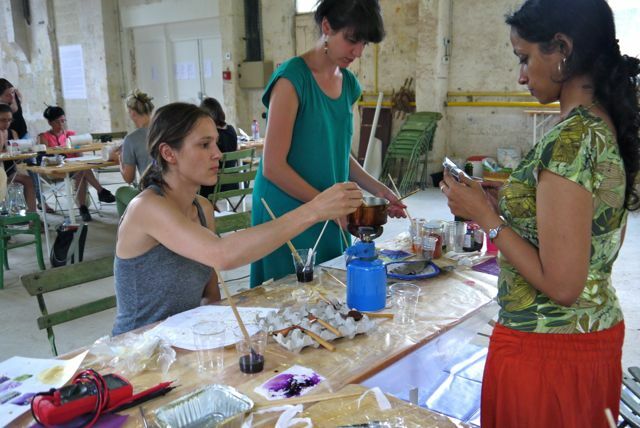 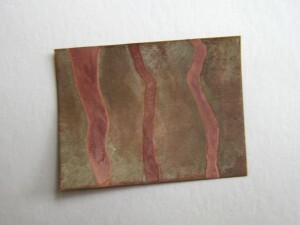 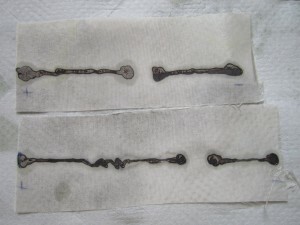 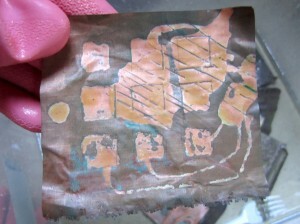 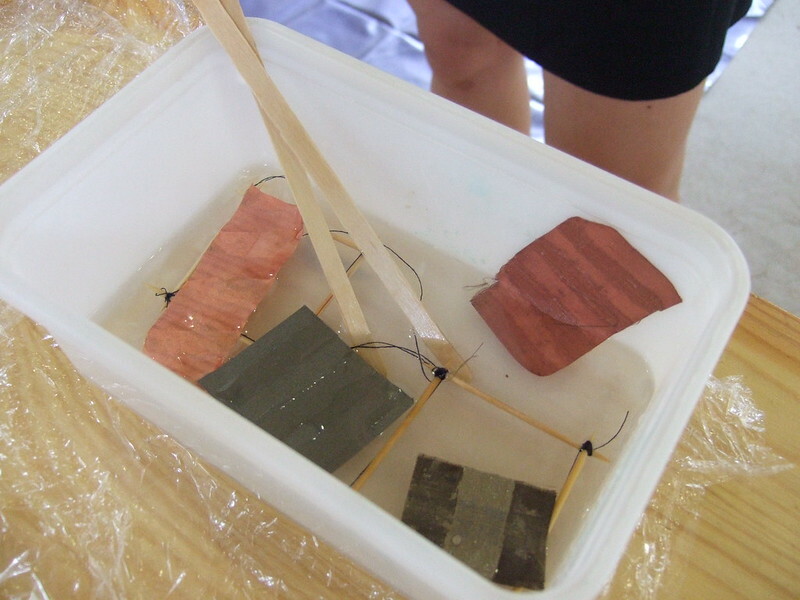 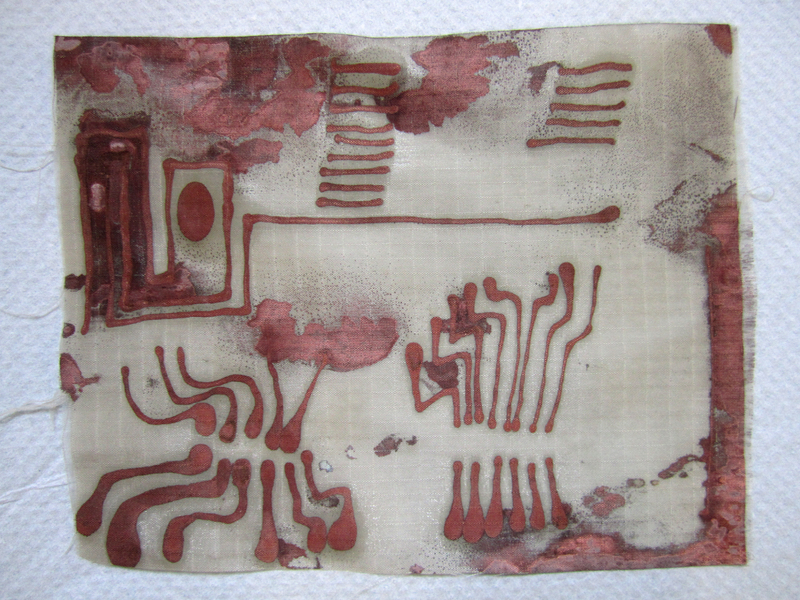 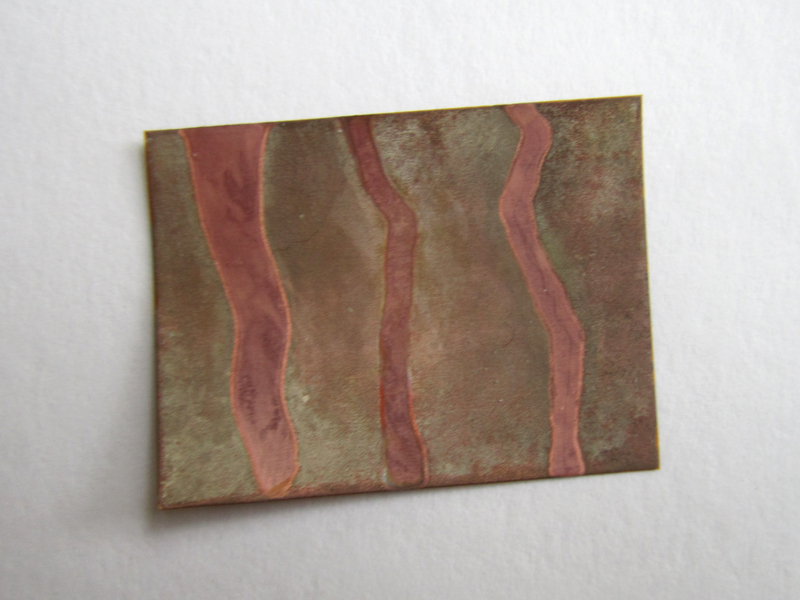 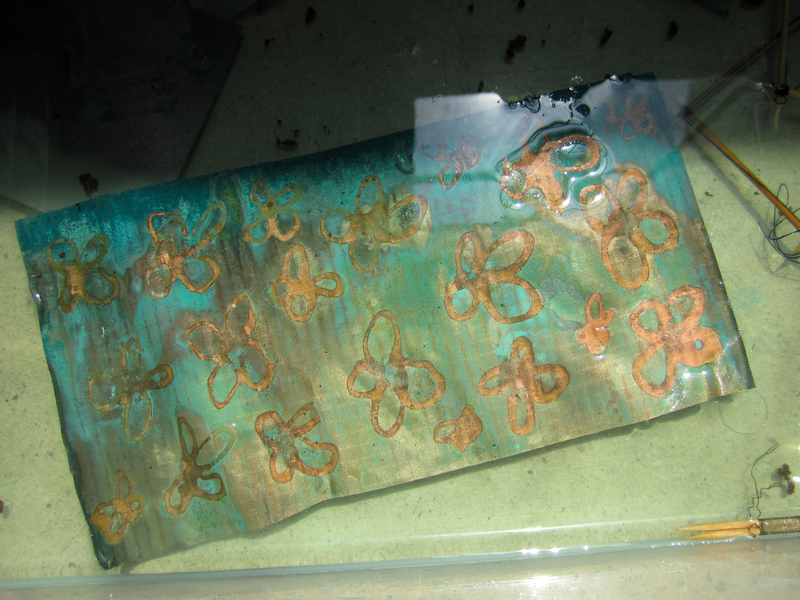 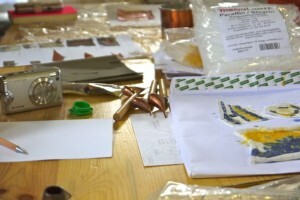 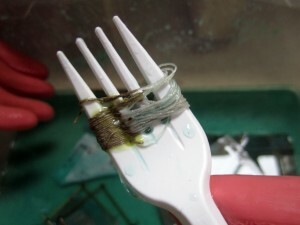 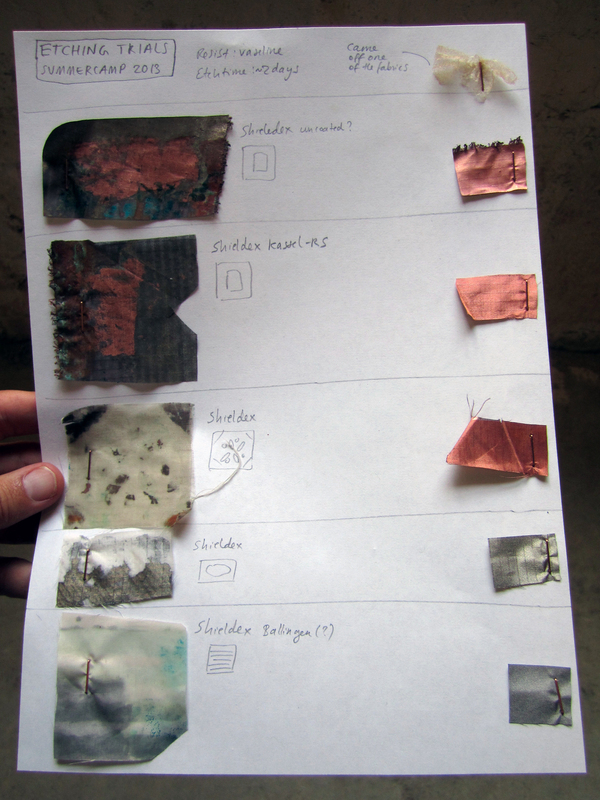 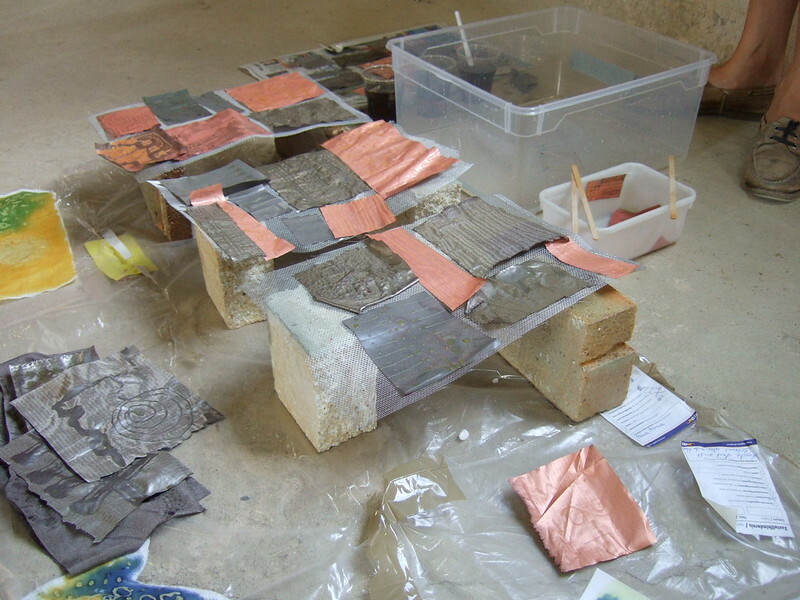 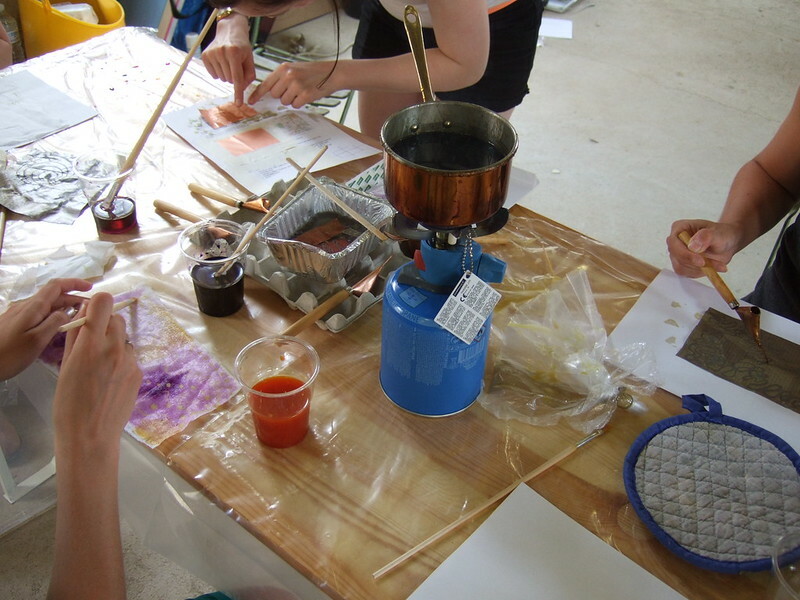 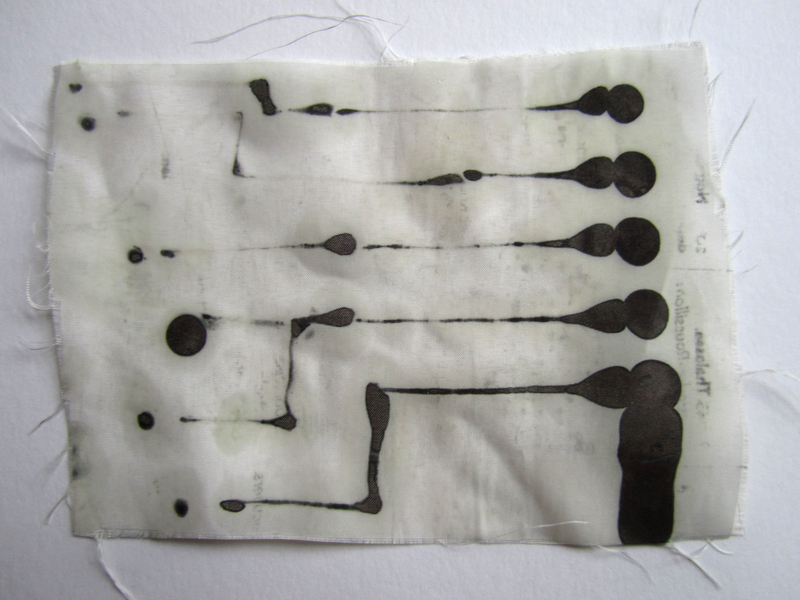 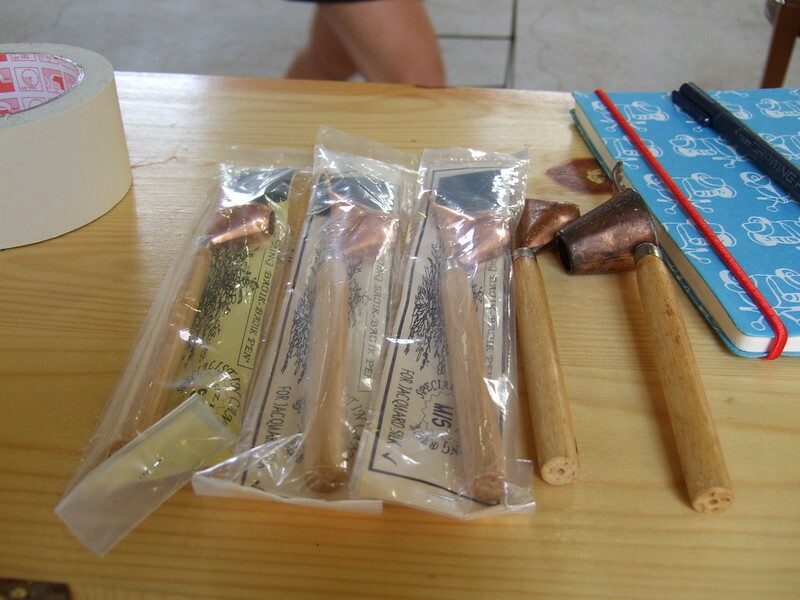 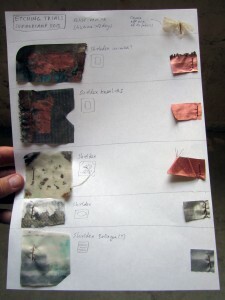 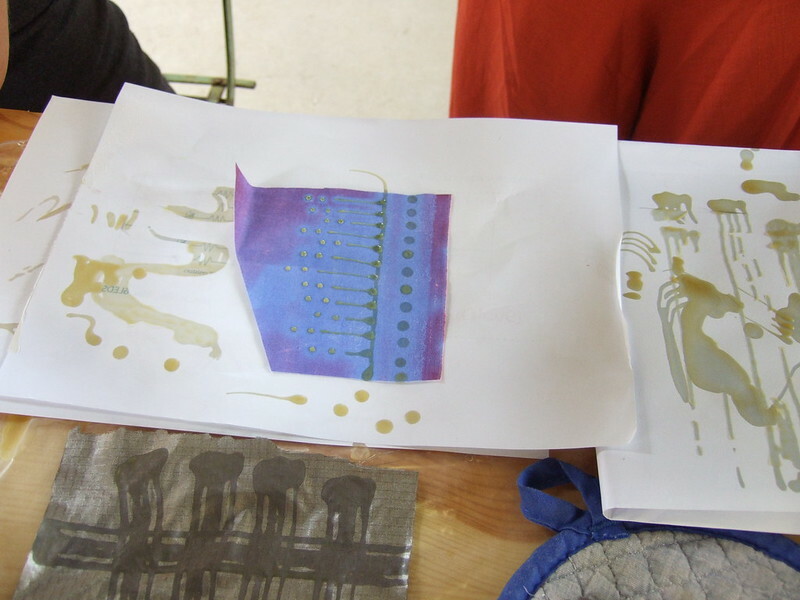 Use Batik Technique to apply wax as a resist and a bath of salt and vinegar to etch away the copper from copper fabric to make circuits and sensors. 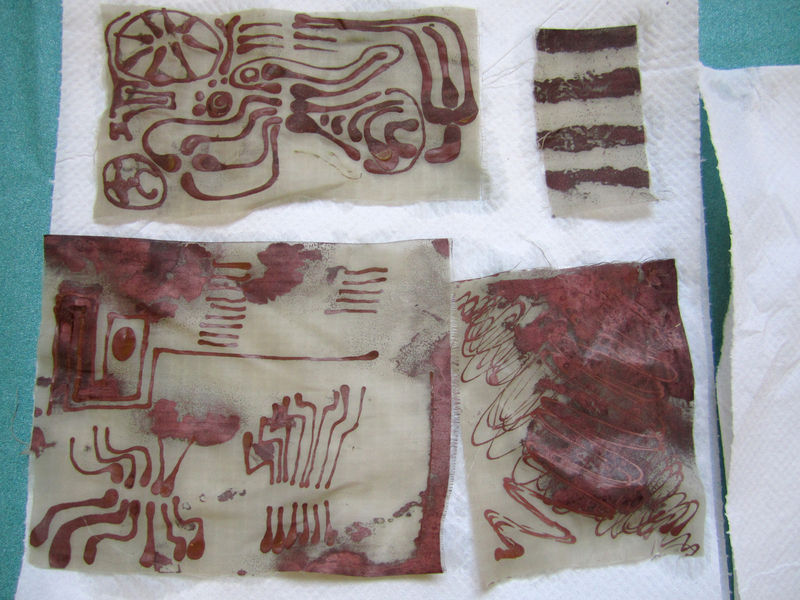 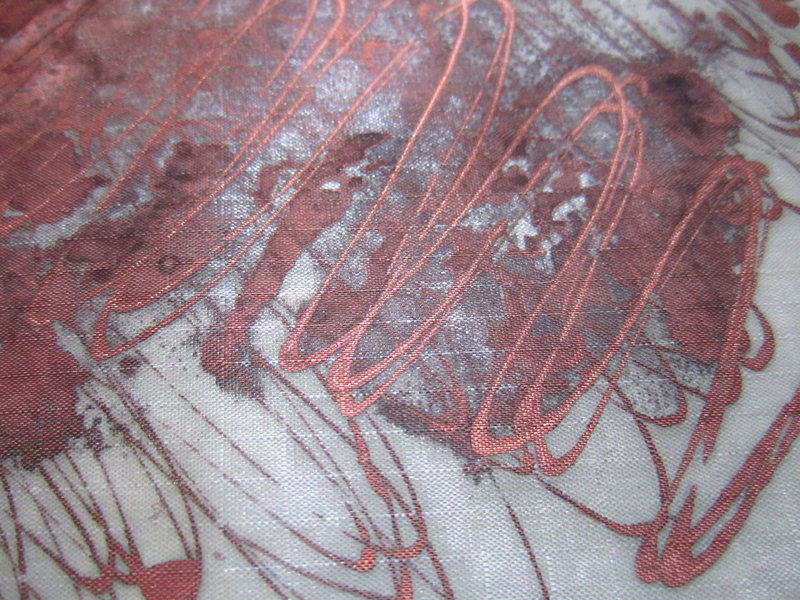 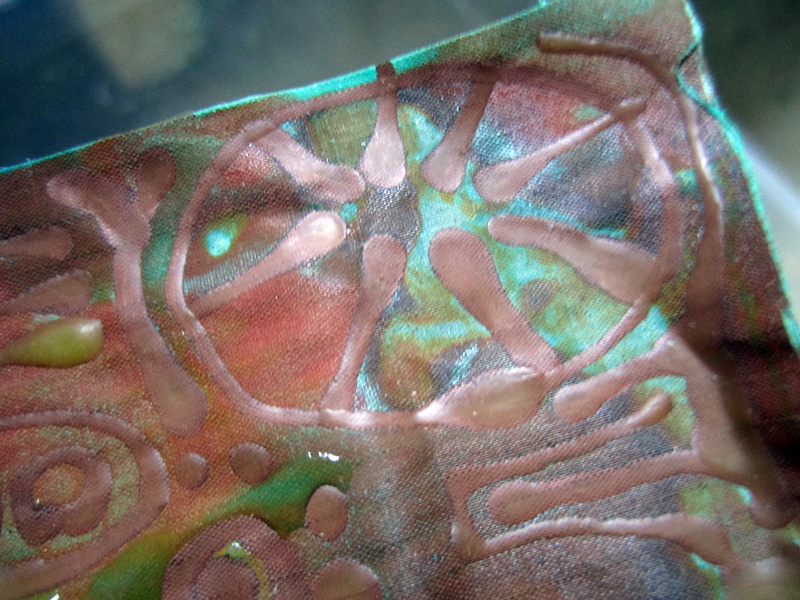 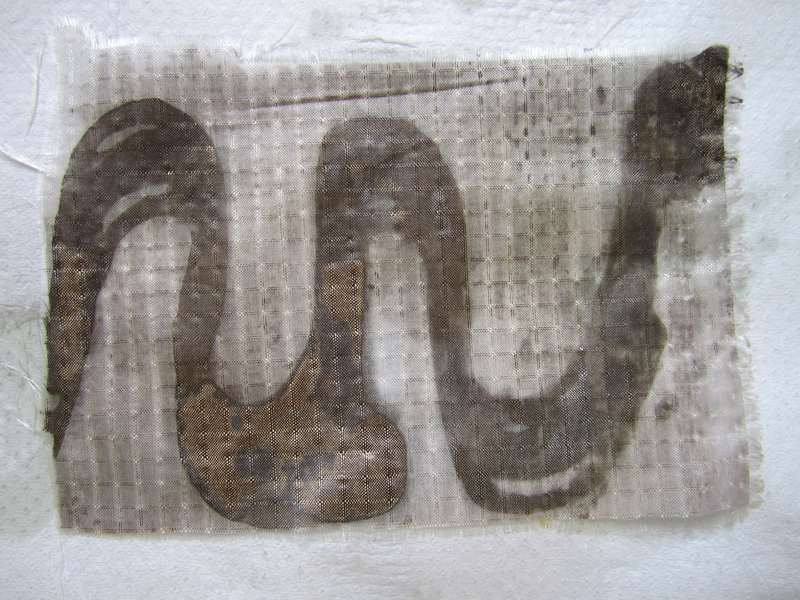 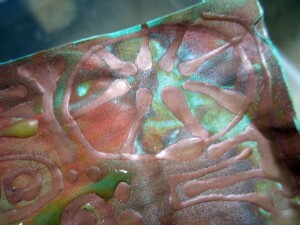 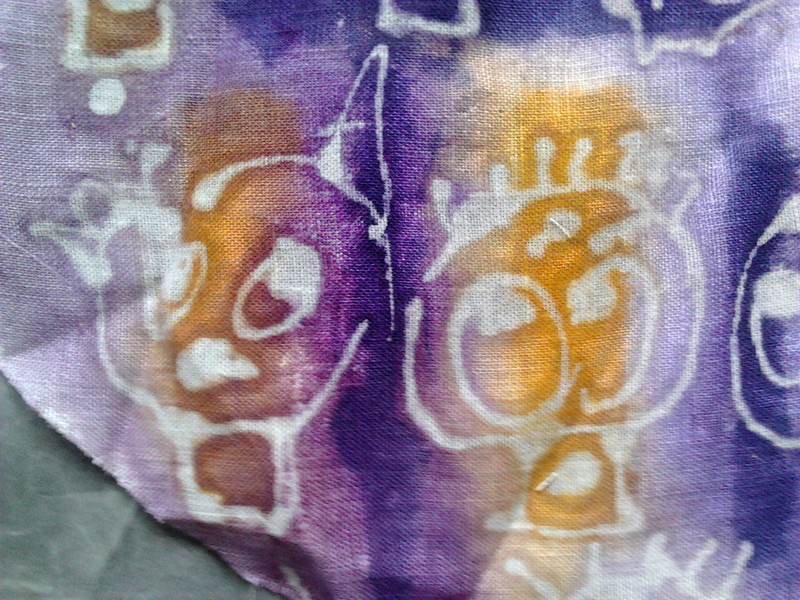 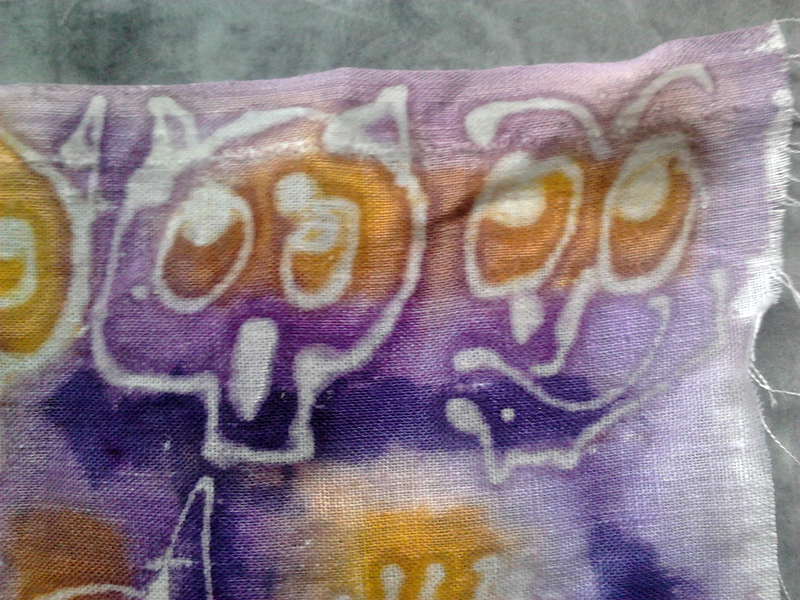 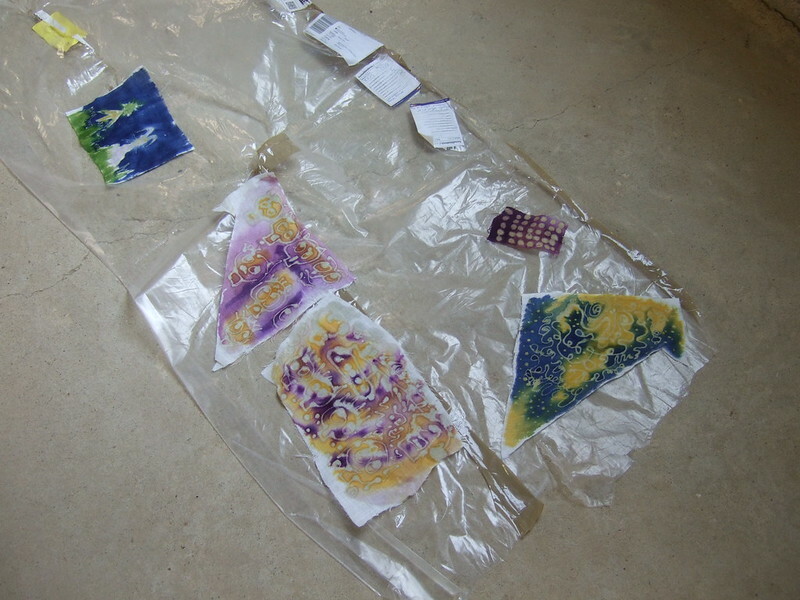 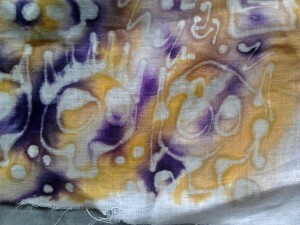 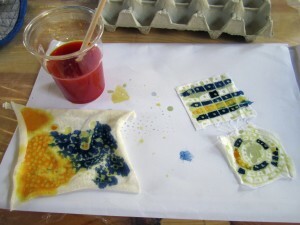 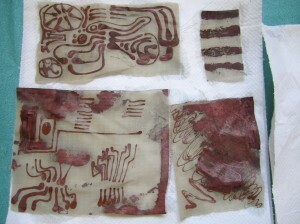 We used wax resist using batik methods. 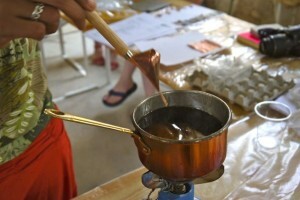 The wax we used was a combination of beeswax and paraffin wax, around 3:1 ratio. 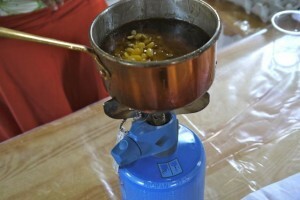 We used more beeswax than paraffin because beeswax is softer and doesn’t tend to crack like paraffin wax does. 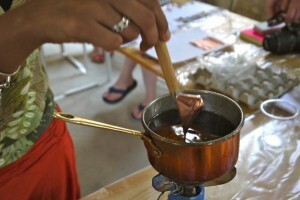 However, paraffin is much cheaper than beeswax, so adding some to the mix will reduce costs. It’s also possible to use vaseline by making a mask with tape and then carefully applying vaseline. 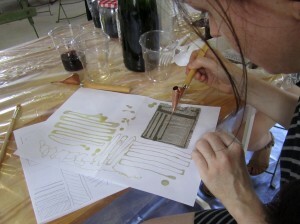 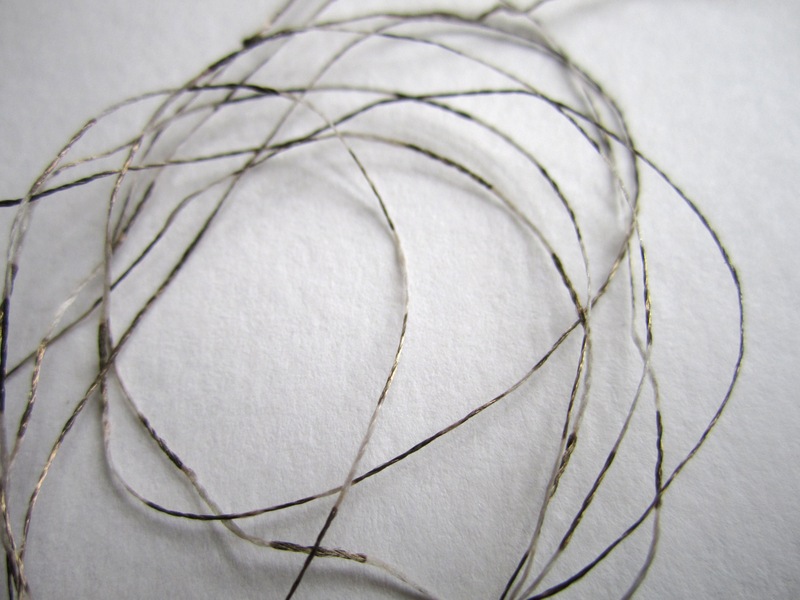 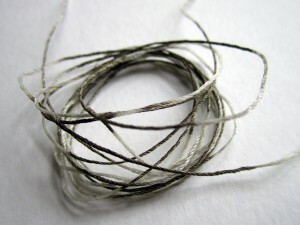 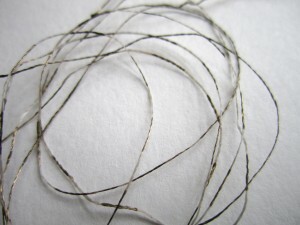 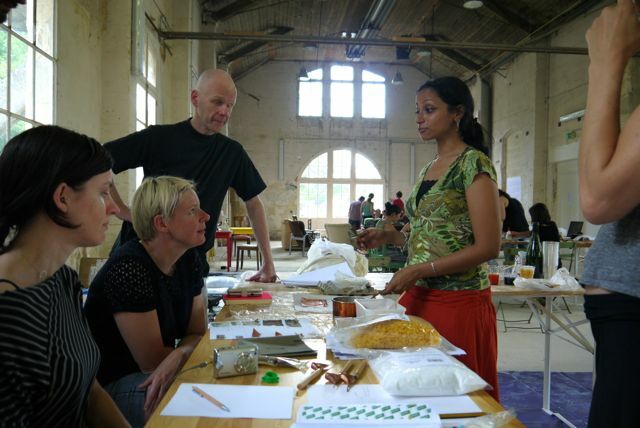 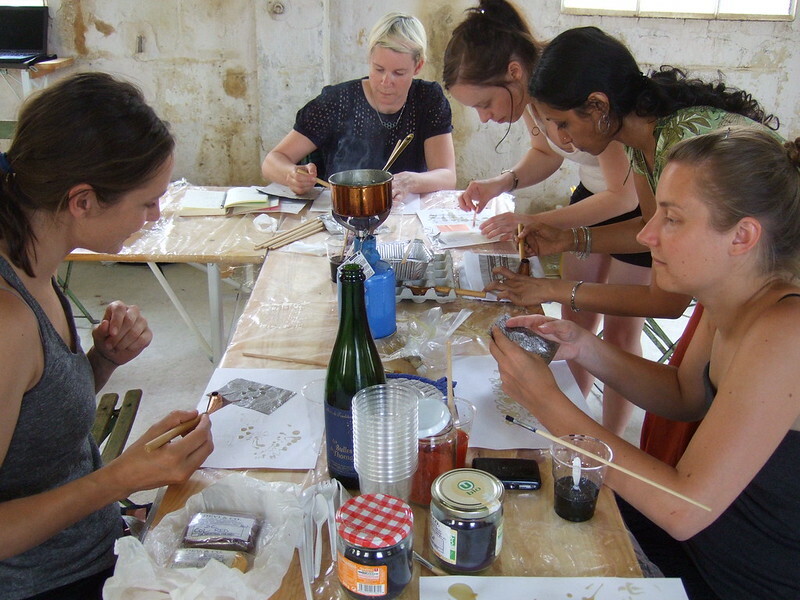 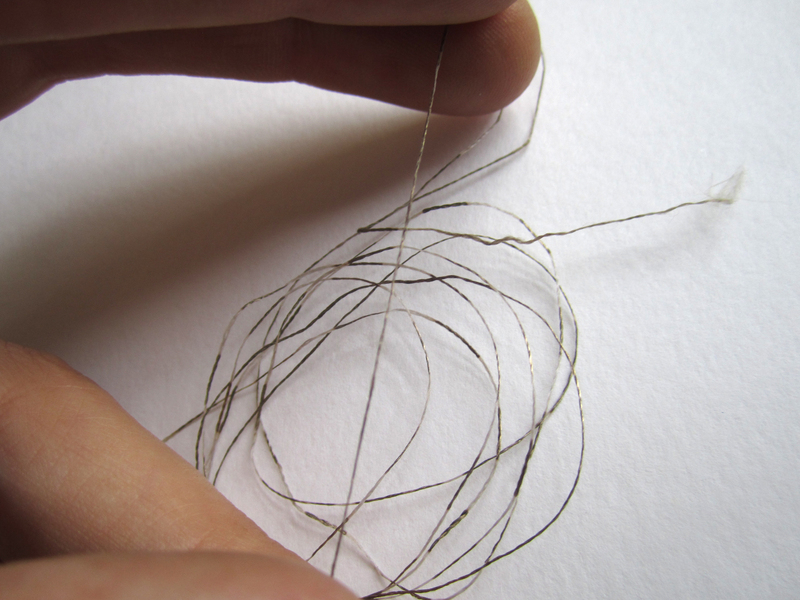 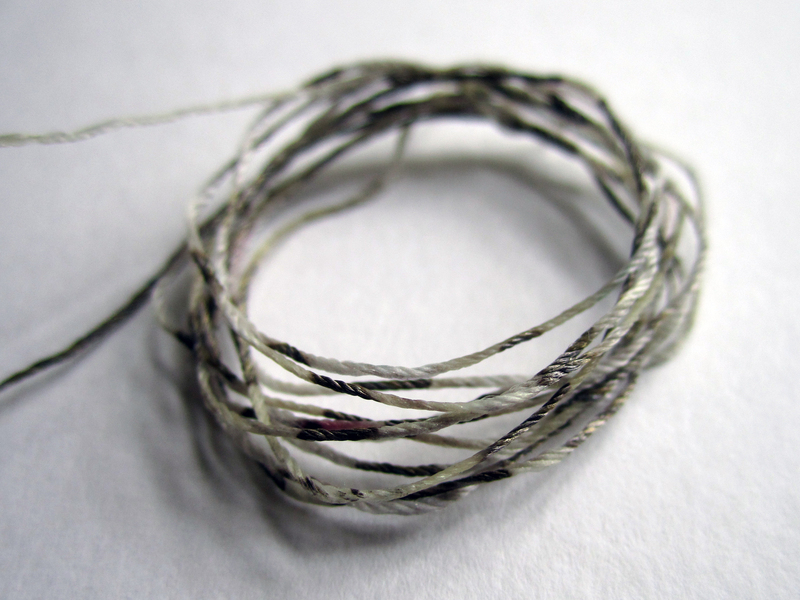 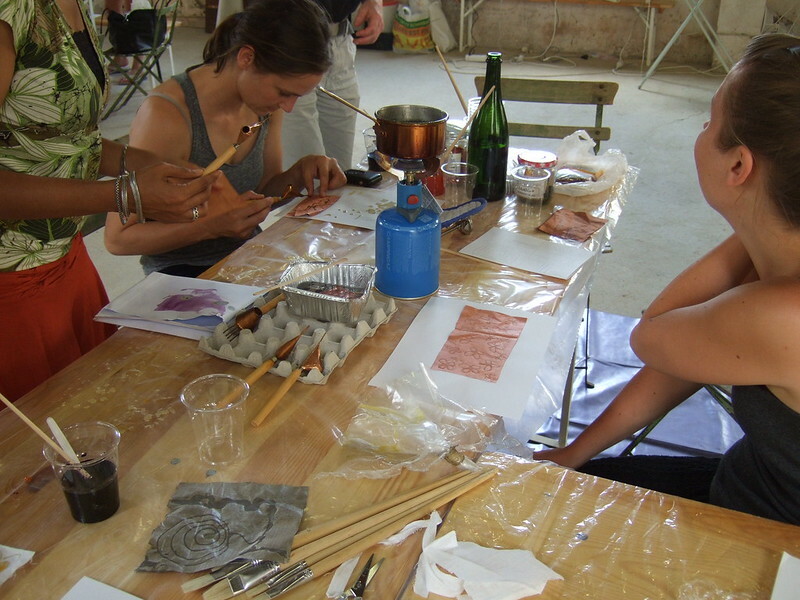 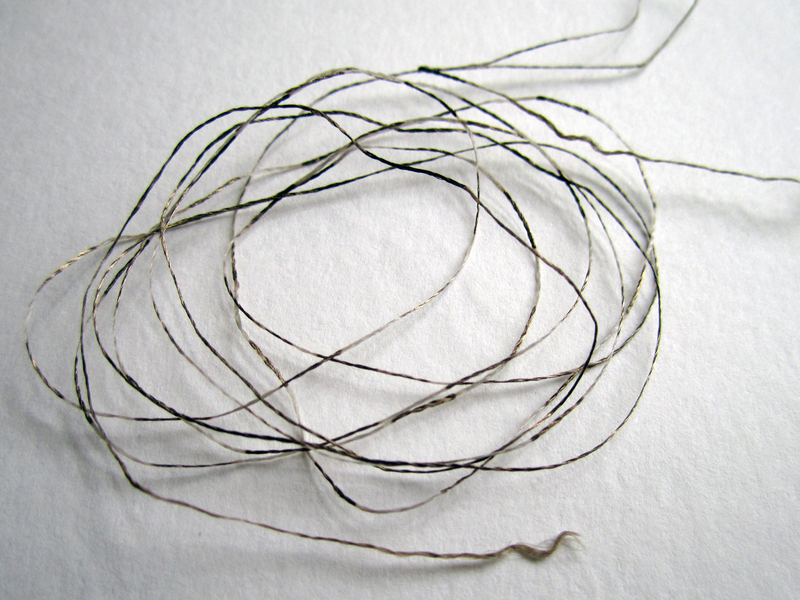 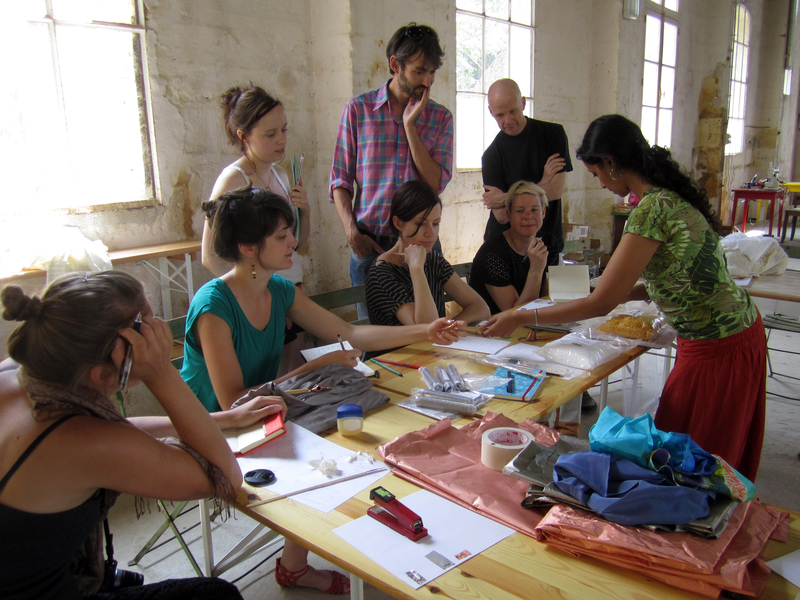 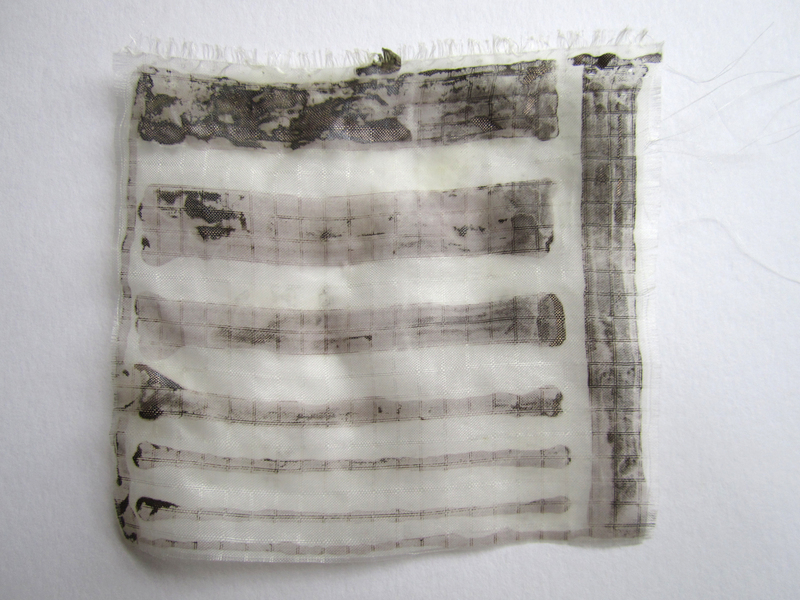 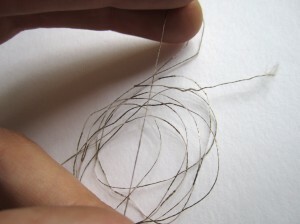 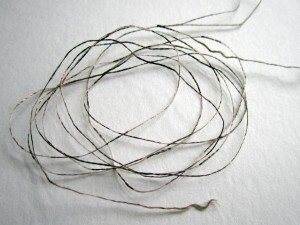 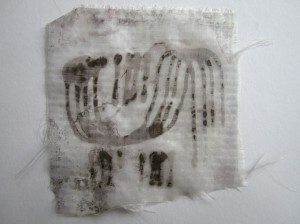 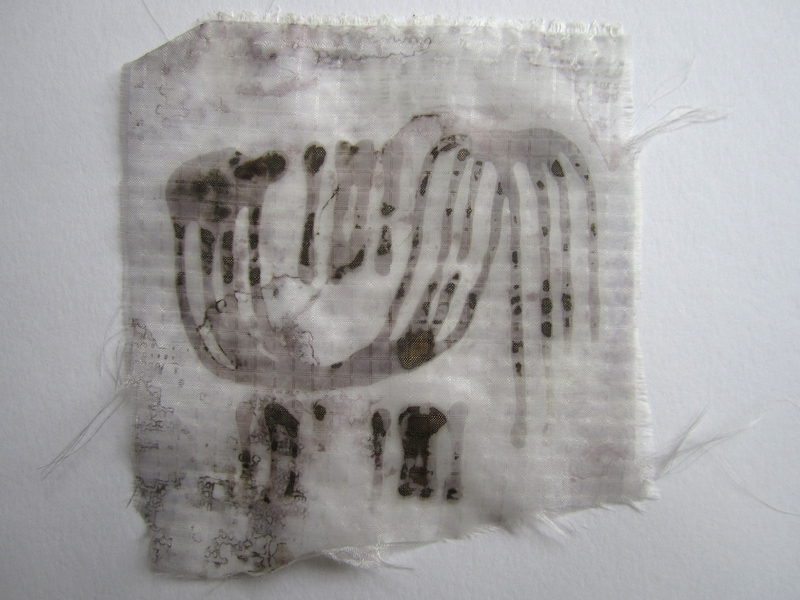 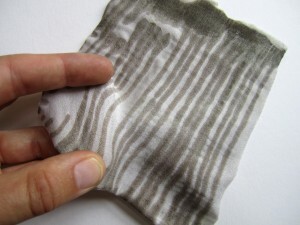 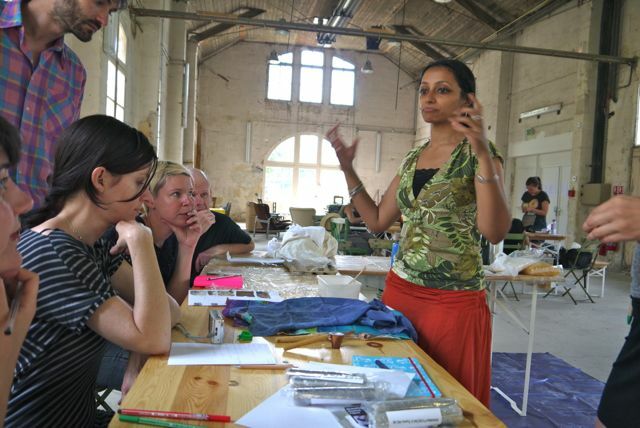 Somebody also suggested using drawing gum, aka Manutex – would be cool to try! We used a salt and vinegar solution to etch – distilled vinegar seems to work best. 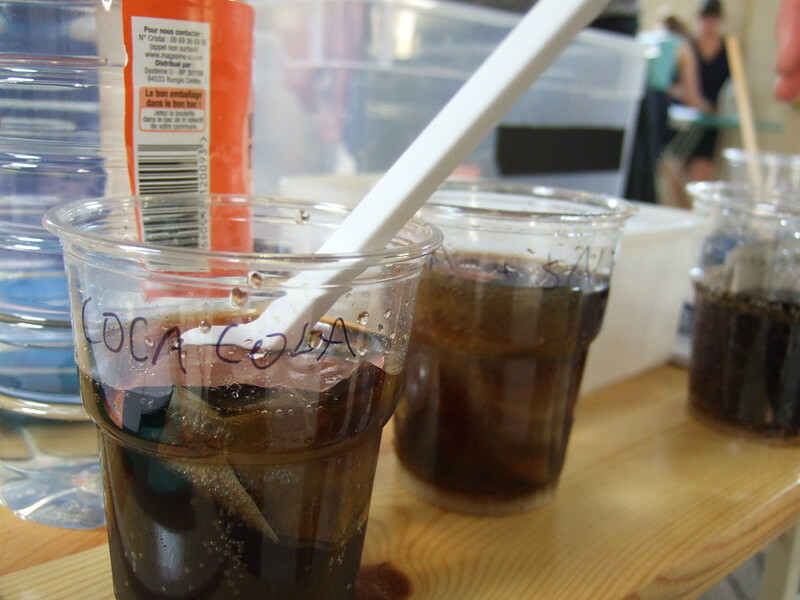 We also did some experiments using Coca-Cola® (with and without salt). The salty version (add salt over the sink as it causes the Coke to bubble over) worked best, but still not as well as the distilled vinegar and salt combination. 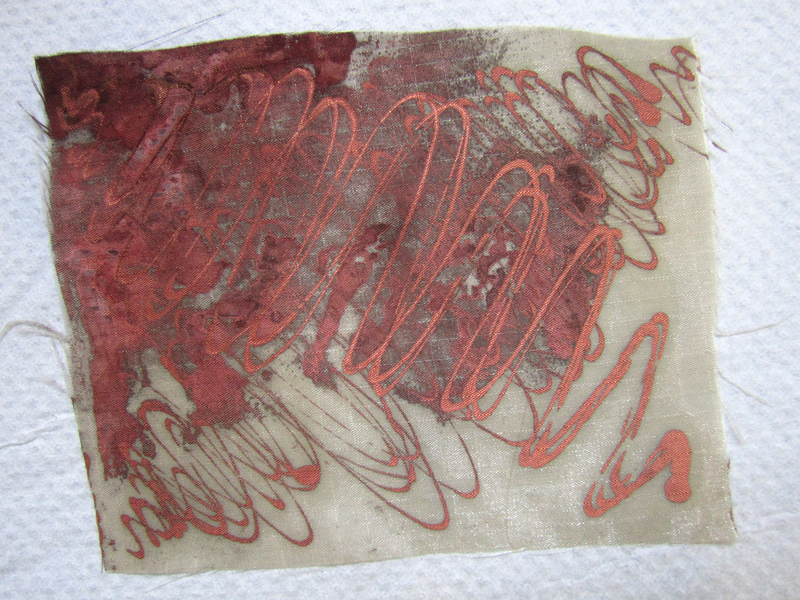 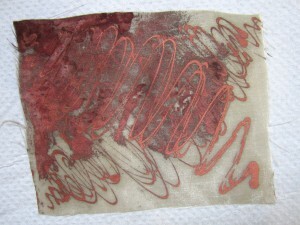 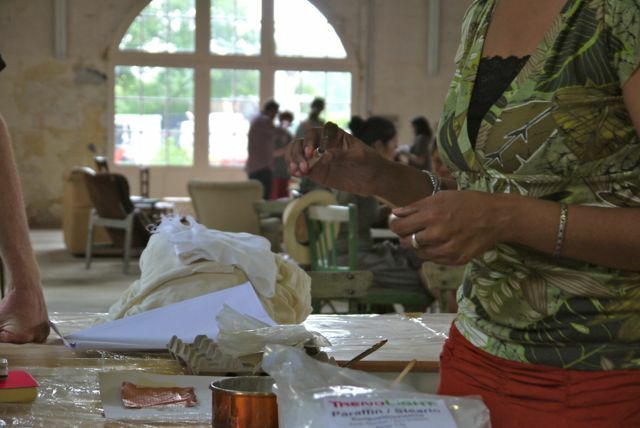 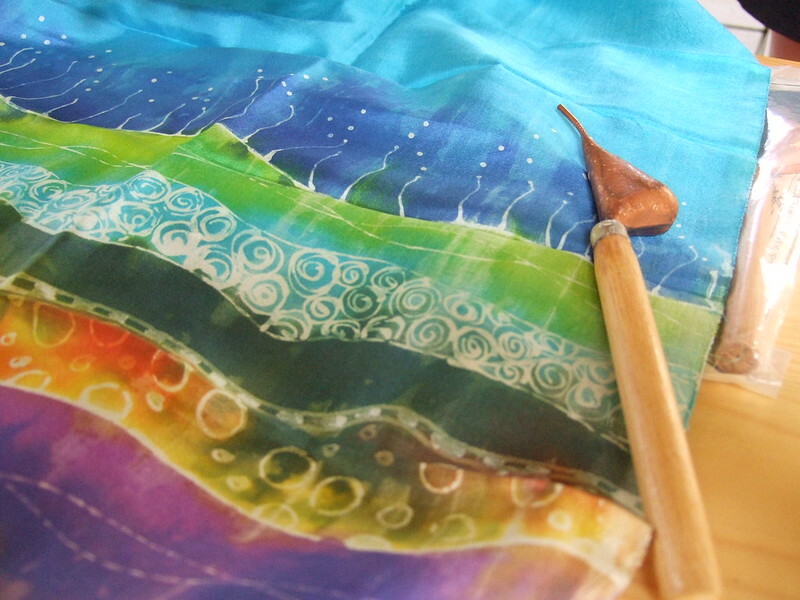 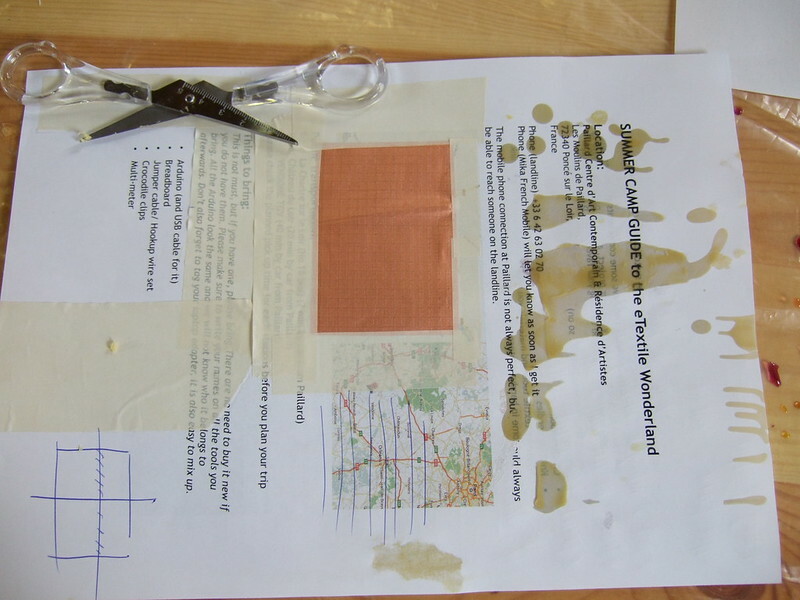 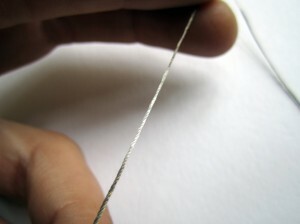 Work on top of a piece of paper, as the wax will penetrate the fabric right through. 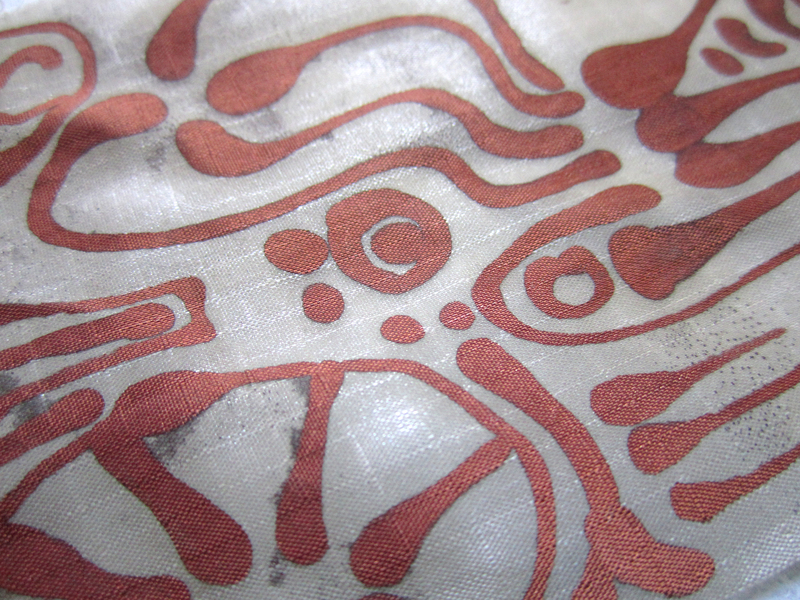 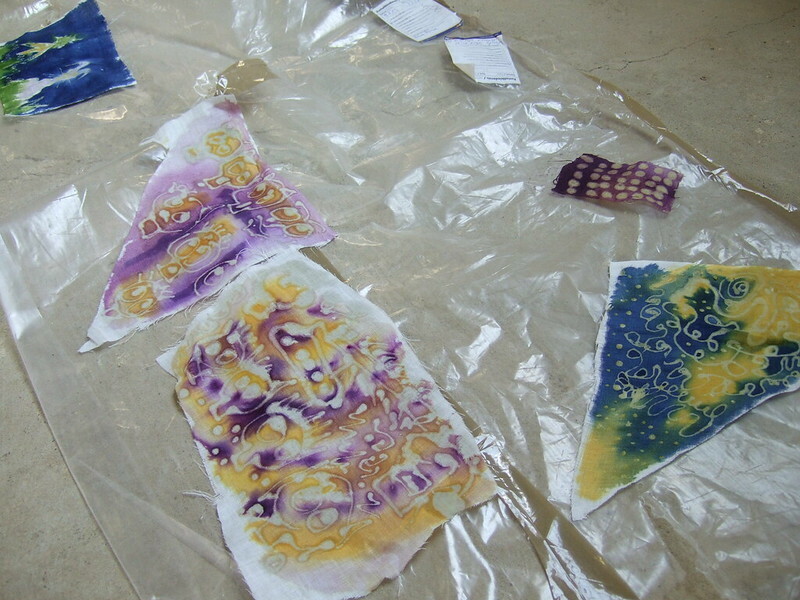 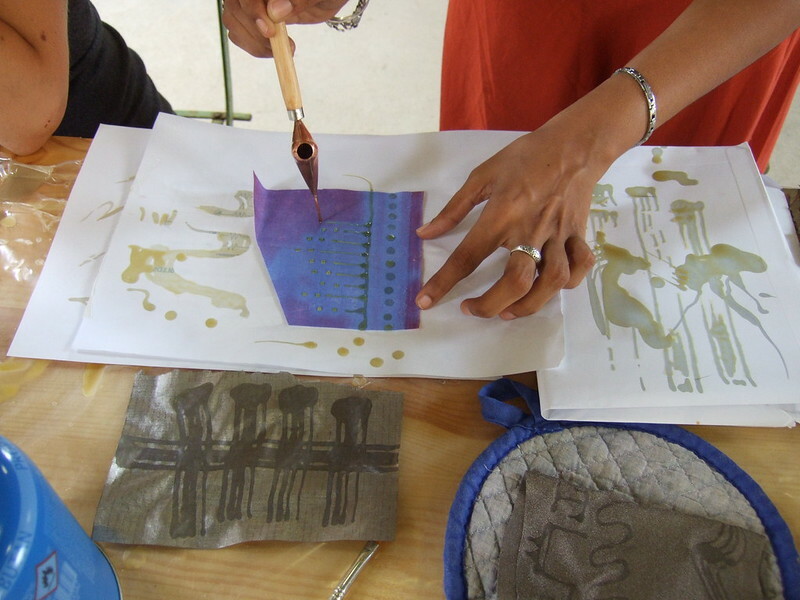 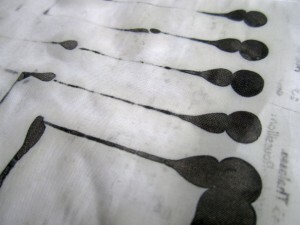 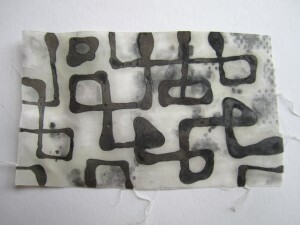 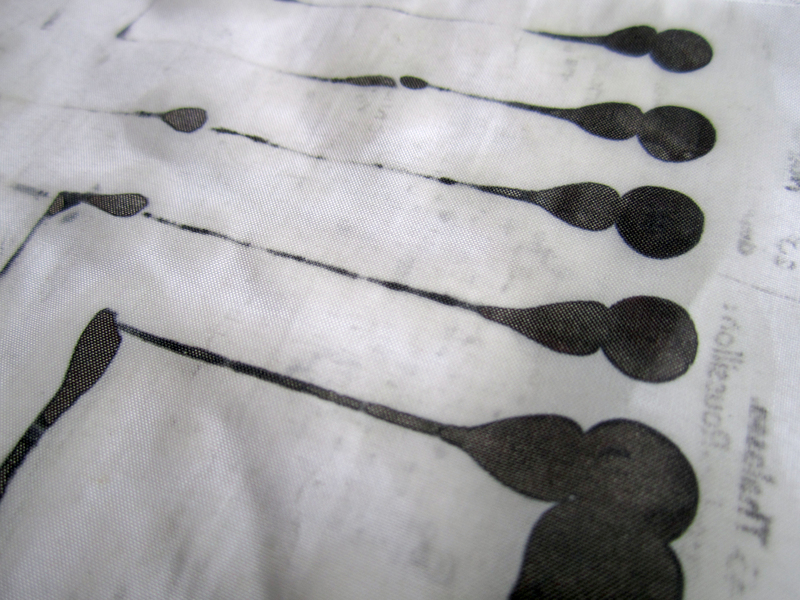 Using tjanting batik tools, we heated our wax to ±60 degrees Celsius and drew patterns onto the fabric. 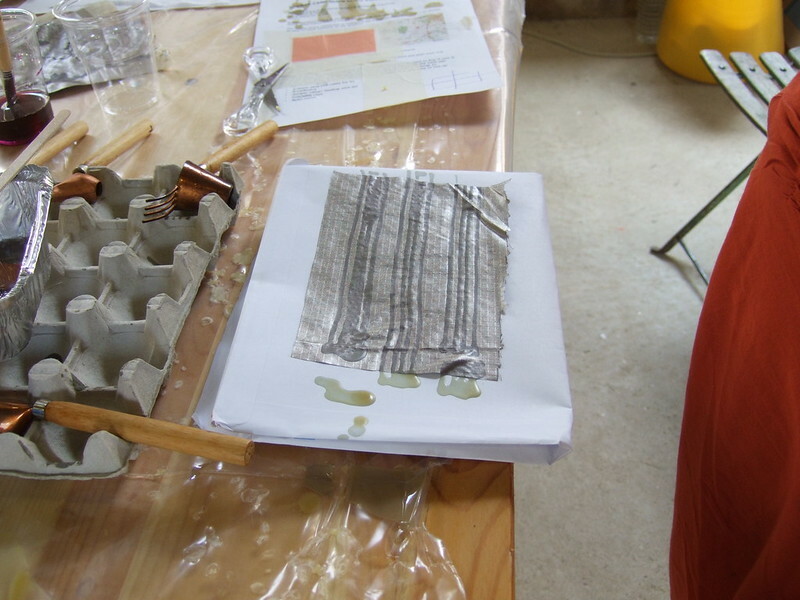 It’s best to plan your design first, and takes quite a bit of skill to get it just right. 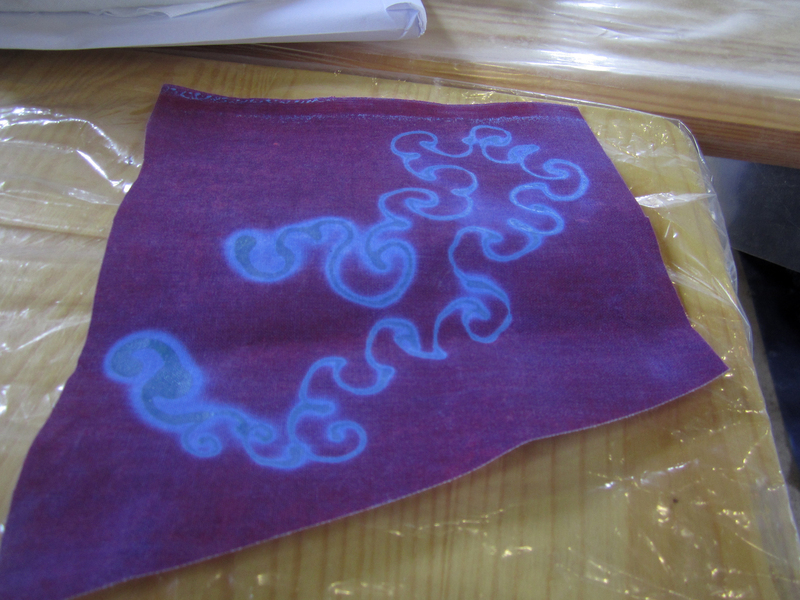 It’s also important to work quickly, so that the wax doesn’t blob out onto the fabric. If done correctly, the wax should go right through the fabric and stick to the paper underneath. 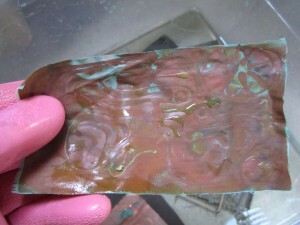 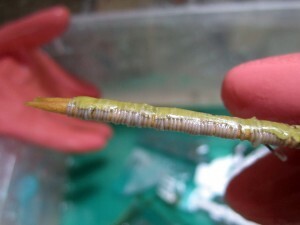 The wax cools quickly and tools need to be re-dipped/re-heated every minute or so. Once cool, we added our fabric swatches to the salt and vinegar bath. 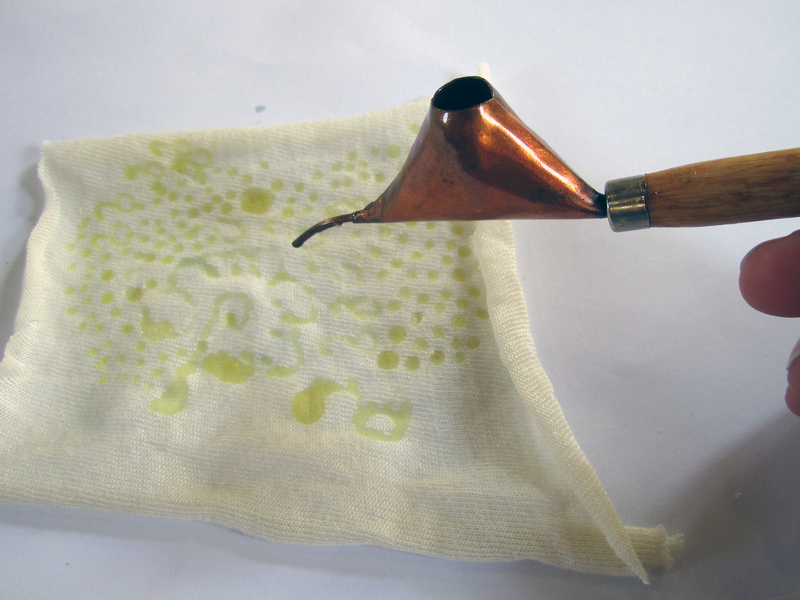 The etching process requires exposure to air in order to work, so don’t just soak your fabric in the solution, allow it to contact the air as well. 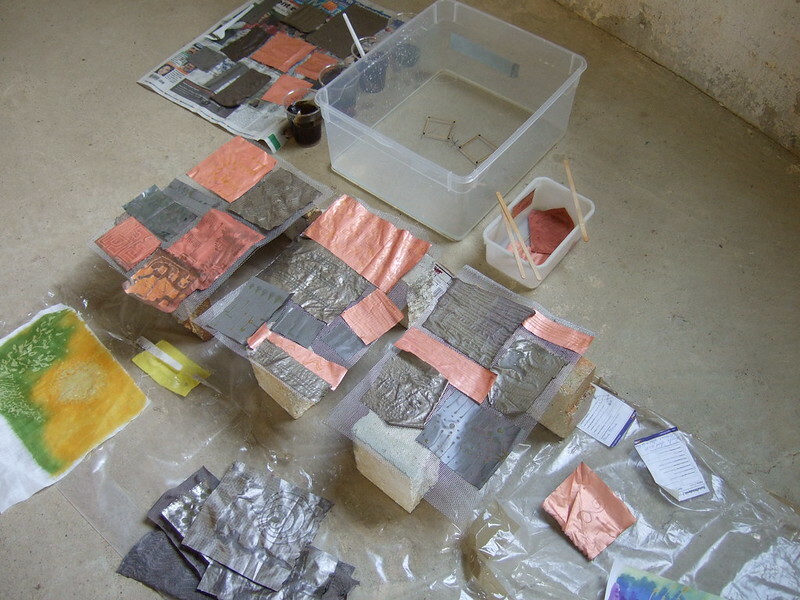 Other factors in the success of the etching are time and temperature. 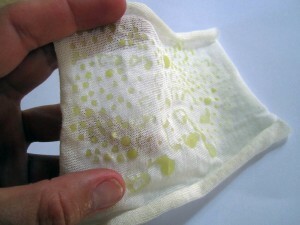 Depending on the temperature, it can take anywhere between 8 hours and a day. 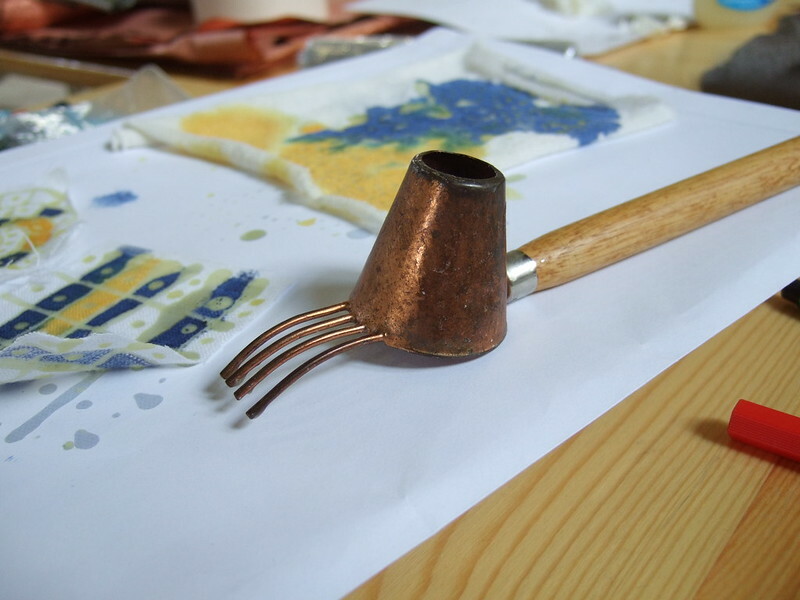 It’s important to keep checking your pieces, because once etching starts, it can advance quite quickly!